Welcome to the information page for the listening bench installed in Witham, Essex. 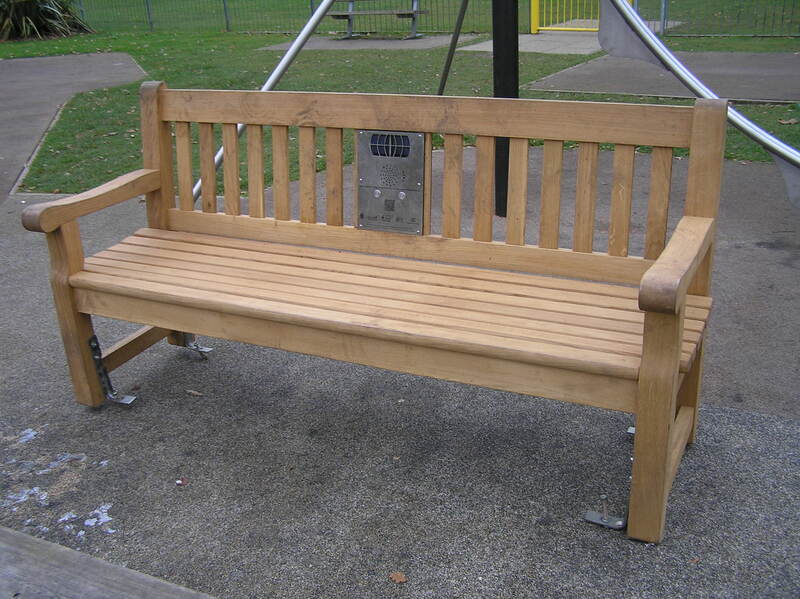 The bench features clips from oral history interviews with local residents, recorded by Janet Gyford. They cover different types of work in the town, the opening of the new Witham Secondary Modern School, and clothing worn in the early twentieth century. You can explore more of the collection of interviews on the History of Witham website. The bench is situated along the River Walk. Continue on the footpath at the top of Guithavon Street to find it. The bench has been put together by a group of volunteers and is supported by Witham Town Council and the Witham and Countryside Society. It is part of the Witham Town Trail – click here to explore the rest of the trail. Edie Brown describes getting sacked from her job at Pinkham’s, and almost getting sacked from Cooper Tabor (SA 59/1/5/1). Gerald Palmer describes his father’s harness maker’s shop, which used to be on Newland Street, and his father’s daily routine (SA 59/1/102/1). Lucy Croxall recalls being invited to join the teaching staff when Witham Secondary Modern School first opened in 1937 (SA 59/1/23/1). It later became Bramston School, and was recently replaced by Maltings Academy. Edie Brown recalls the hard work of domestic service at the White Hart Hotel in the early twentieth century (SA 59/1/5/1). Edie Brown also did domestic service for the eminent Round family. Here she describes her battle to get the fire lit one morning (SA 59/1/5/1). Mabel Nicol describes the clothes she made and wore in the early twentieth century, including her ‘Sunday best’ clothes (SA 59/1/12/1).